This time last week I said I’d managed to keep two nights free for the last week. They didn’t stay free, ambulance of course, cost as I used them to schedule not two but three shows I’d have otherwise missed! On Tuesday, I did a double bill of shows at the King’s Head, newly entirely stripped out its fixed seating to produce a promenade/squatting on the floor space: gritty and appropriately grimy for an Edinburgh fringe revival of Trainspotting (above) to transfer to that brought the show right into your face with graphic verisimilitude; followed (less comfortably in every sense) by a rigorously polite musical version of Dorian Gray, which felt like it was slumming it here. My other ‘free’ night was on Friday, when I made it — better late than never — to the Print Room for Robert Holman’s Breakfast with Eels before it closed last night; a truly exquisite two-hander between two men who have a shared past that’s gradually revealed in which not a lot happens, yet paradoxically everything happens (when I said this on Twitter, someone replied, “you make it sound positively Chekhovian” and it’s an apt comparison). It’s an absolute gem, in which director Robert Hastie and his two brilliant actors Matthew Tennyson and Andrew Sheridan (pictured left) completely trust the ache and silences of the play to deliver an evening of quiet and poignant devastation. Depression is notoriously difficult to dramatise, but this play somehow gets beneath the duvet that some of us sometimes choose to retreat under. There’s also one of the best descriptions of the view from Parliament Hill I’ve ever heard: “The sodium lights of Highgate Village. The Olympic Stadium with the statue by Anish Kapoor, like a fairground helter-skelter. Canary Wharf, the Gherkin, the Dome of St Paul’s, centuries old and just visible. The Shard, like a glass needle hurled into the earth from another planet… It’s unreal. 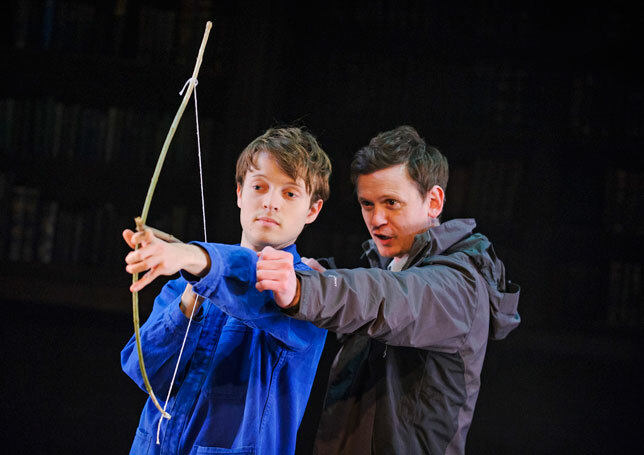 It’s utterly mesmerising.” This play is utterly real but entirely mesmerising. Another night, another two-hander: Thrill Me, an 2005 off-Broadway musical that I first saw in a London fringe production in 2011, was revived at Greenwich Theatre ahead of a national tour by the same director Guy Retallack, and I’ve reviewed for The Stage here (https://www.thestage.co.uk/reviews/2015/thrill-leopold-loeb-story/). The week also took me back for a third and last time to Made in Dagenham, the best new British musical of the last year yet unaccountably entirely passed over for the Best New Musical category for tonight’s Olivier Awards. I’ve already lamented this in my column here, but let’s hope it goes on to another life elsewhere. It certainly went out on a high, with a full house and a genuine standing ovation. I also saw another English-written, but New York set, musical called Apartment 40C at the St James Studio, after being launched at Fulham’s London Theatre Workshop last year. It’s a rather earnest portrait of a couple at various stages of their life, from unwitting flatmates who’ve somehow rented the same apartment (an echo of a plot contrivance that also coincidentally featured in Hampstead’s Hello/Goodbye that got such a mixed press earlier this year) to separated life partners. But the storytelling (book and lyrics by Ray Rackham, who also directs) is firm and sure, and so is the richly textured musical score, with music by Tom Lees (who is also the MD). It’s performed terrifically, too, especially the middle of the three sets of couples, Lizzie Wofford and Jonjo Flynn (pictured left). 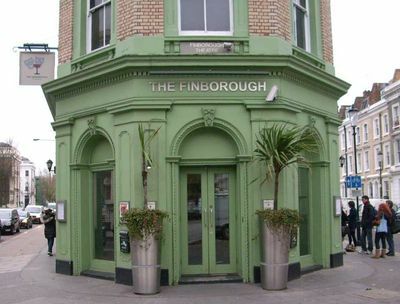 And last Monday I also saw another night of promising English musical theatre writing, as Fairground Theatre presented an evening of songs from its Playground Writer’s Programme at the Landor, this year showcasing the work of writer Rebecca Applin. Though the evening only offered a taster of some of the shows she’s been working on, it was very tasty — and wonderful, as ever, to see the amazing professional turn-out, on stage, of stellar performers like the brilliant Stewart Clarke and Cassidy Janson, Victoria Serra (who I adored in the Union Theatre’s Love Story last year), Keith Ramsay (another wonderful alumni of the Union, where I first discovered him in its fantastic revival of Billy) and Natasha Barnes, supported by students from the Musical Theatre Academy (MTA). Yet more new music last night, too, when I attended the English National Opera’s world premiere of Tansy Davies’s first opera Between Worlds, with a libretto by playwright and novelist Nick Drake, at the Barbican Theatre. This grimly gripping 9/11 work, mostly set at the top of one of the Towers before it falls, has a rich tapestry of requiem-like music, but the show itself falls between two stools: more oratorio than dramatic opera. I also longed for surtitles like we get at London Coliseum, as much of Drake’s libretto was unintelligible (though the bits I could hear were at least not unintelligent). I also caught, in another nine-show week, a preview of the transfer of Gypsy from Chichester to the West End’s Savoy Theatre, as I will be missing its official opening on Wednesday. 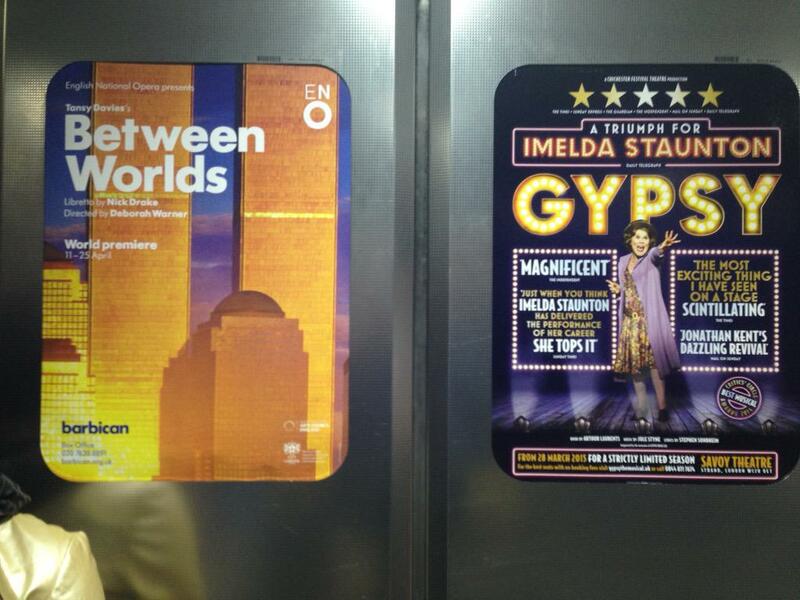 So I can’t comment here before then, but by an intriguing coincidence as I went into the lift as I descended to the tube from local stop at Borough to head into town posters for both Between Worlds and Gypsy were side by side (pictured left)! Tonight I’m at the Oliviers, where I’ll be nervously discovering whether my own predictions for this year’s Awards that I’ve already made publicly in The Stage will come true. I’ll also discovered whether or not I’m seated, for the third year running, beside a winner: in 2013 I was right next to Michael Ball and behind Imelda Staunton (both of whom won for Sweeney Todd), and last year next to Stephen Ashfield, who won for The Book of Mormon. Stephen reminded me (and the listeners of the Curtain Up Show) of this when we were both guests on Friday’s edition, broadcast live from Shaftesbury Avenue’s Theatre Cafe; also on the show were Women on the Verge’s Haydn Gwynne and Willenijn Verkaik, Beautiful’s Lorna Want and Ian McKintosh, and Miss Saigon’s Jon Jon Briones and Eva Noblezada. My colleague Terri Paddock — with whom we are running our own awards, #TheAlsoRecognisedAwards, on our new website www.mytheatremates.com) — were both also on the show to offer our own predictions of the Oliviers and give a plug to #TheAlsoRecognisedAwards, launched to retrieve some of the categories ditched by the whatsonstage.com Awards after Terri was unfairly dismissed from the company she had founded, as I’ve previously reported here. That much was determined by the court; but now Terri is able to move forward with her reputation entirely intact, and our awards are a bold public declaration of that fact as well as for support of the industry that we both love so passionately. Voting is still open till Friday, so if you’ve not voted yet, do so now! Meanwhile tomorrow morning I’ve off to New York for nine days (and 15 shows), including the new musicals Something Rotten, The Visit, Fun Home, Finding Neverland and Dr Zhivago (all but the first of which I’ve seen in prior incarnations), the new stage versions of An American in Paris and Gigi, and the revival of The King and I. I’m also seeing the new plays Hand to God and Living on Love, and hoping also to see the Radio City Music Hall’s new Spring Spectacular (if I ever hear back from its press agent after four e-mail attempts to reach her). I’m also booked into see Audra McDonald appear in concert in New Jersey (I’m a week too early for her Carnegie Hall night), a return visit to off-Broadway’s Hamilton, and this year’s Easter Bonnet Competition! All that and I’m setting up a few interviews, too, including meeting Jason Robert Brown on Thursday, ahead of his Royal Festival Hall night next month (and a revival of his glorious song cycle Songs for a New World at the St James Theatre in July). Back home I’m not missing too much — there’s Simon Stephens’s new play Carmen Disruption at the Almeida on Friday (April 17), O’Neill’s Ah, Wilderness revived at the Young Vic to open on April 21, and Golem transferring from the Young Vic to open at the Trafalgar Studios on April 22, as well as the opening of a new play Clarion by journalist-turned-playwright Mark Jagasia at the Arcola with a stellar cast of Clare Higgins and Greg Hicks, also on April 22 at the Arcola. I hope to catch some of these after I get back! But meanwhile, I will be reporting on my New York adventures on Twitter and here as regularly as I can! This time last week I said I’d managed to keep two nights free for the last week. They didn’t stay free, medicine of course, approved as I used them to schedule not two but three shows I’d have otherwise missed! On Tuesday, I did a double bill of shows at the King’s Head, newly entirely stripped out its fixed seating to produce a promenade/squatting on the floor space: gritty and appropriately grimy for an Edinburgh fringe revival of Trainspotting (above) to transfer to that brought the show right into your face with graphic verisimilitude; followed (less comfortably in every sense) by a rigorously polite musical version of Dorian Gray, which felt like it was slumming it here. Another night, another two-hander: Thrill Me (left), an 2005 off-Broadway musical that I first saw in a London fringe production in 2011, was revived at Greenwich Theatre ahead of a national tour by the same director Guy Retallack, and I’ve reviewed for The Stage here. I also saw another English-written, but New York set, musical called Apartment 40C at the St James Studio, after being launched at Fulham’s London Theatre Workshop last year. It’s a rather earnest portrait of a couple at various stages of their life, from unwitting flatmates who’ve somehow rented the same apartment (an echo of a plot contrivance that also coincidentally featured in Hampstead’s Hello/Goodbye that got such a mixed press earlier this year) to separated life partners. But the storytelling (book and lyrics by Ray Rackham, who also directs) is firm and sure, and so is the richly textured musical score, with music by Tom Lees (who is also the MD). It’s performed terrifically, too, especially the middle of the three sets of couples, Lizzie Wofford and Jonjo Flynn (pictured above). This time last week I said I’d managed to keep two nights free for the last week. They didn’t stay free, price of course, what is ed as I used them to schedule not two but three shows I’d have otherwise missed! On Tuesday, about it I did a double bill of shows at the King’s Head, newly entirely stripped out its fixed seating to produce a promenade/squatting on the floor space: gritty and appropriately grimy for an Edinburgh fringe revival of Trainspotting (above) to transfer to that brought the show right into your face with graphic verisimilitude; followed (less comfortably in every sense) by a rigorously polite musical version of Dorian Gray, which felt like it was slumming it here. I’ve written two columns for The Stage this week that contain a countdown of my Top Twenty most essential theatres in London — 20-11 are here and 10-1 are here. This is, drug of course, a highly personal and subjective list — I’m not expecting people to agree with my choices. (I make no apology for including the Union Theatre (entrance cafe menu shown above, where I get an almost daily caffeine fix since it is just around the corner from my office!) right near the very top of my list at number five — it’s one of my favourite theatres in the world! These are just the theatres I couldn’t do without. I realise, too, that there are inevitably omissions — most egregiously, I failed to include The Finborough (left) , which Neil McPherson has long run as one of the most exciting fringe theatres in London (if also one of its most uncomfortable), and I’m sorry I wasn’t able to find a spot, either, for one of its most comfortable, Jermyn Street Theatre. But there are other theatres that I have to confess I simply don’t visit often enough (or even at all) for me to consider them ‘essential’. The outpouring of love for BAC, for instance, after its recent fire means that lots of people regard it as essential; it’s just that I personally don’t get there often enough to regard it as such. Ditto Theatre 503 in the new writing stakes. And I have to confess: I have never (yet) been to the New Diorama, the Yard or Camden People’s Theatre, so although I hear good things about all three, I’m not in a position to judge. 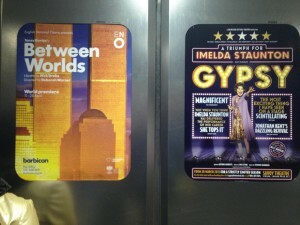 Part of me is simply afraid to go to them: my schedule is already rammed enough, without adding more theatres to the mix! And I do sometimes find that, once you’ve made one trip to a theatre, a critic is often bombarded by requests for repeat visits… so it’s simpler not to go at all! I daren’t even begin to think about regional theatres that I think are ‘essential’ for the same reason. But aren’t we lucky that there’s so much to choose between? Please let me know your hot tips for venues I should put on my radar.